Plumbing facility inspections are an important part of maintaining your commercial property. Especially useful for new property owners or managers, a plumbing facility inspection can inform you of hidden structural problems and help you stay ahead of repairs and replacements to avoid costly emergencies down the road. Keep your commercial facility at peak performance with a thorough plumbing system inspection from Progressive Service Company. Our Raleigh-Durham plumbing experts will perform a professional facility survey, checking all plumbing systems, piping and connections. We’ll itemize and evaluate your entire facility in order to make recommendations for a maintenance schedule and advise you on any necessary plumbing repairs or replacements. At Progressive, we’re always available when you need us. Call us 24 hours a day, 7 days a week to speak to a live, local plumbing pro regarding your commercial plumbing needs. From plumbing facility inspections to installations and repairs, count on Progressive’s 100% satisfaction guaranteed commercial plumbing services. 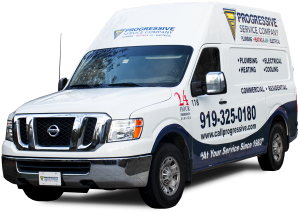 Progressive Service Company is proud to provide plumbing facility inspections to commercial clients in Raleigh, Durham, Chapel Hill, Apex, Cary, Morrisville, Burlington, Carrboro, Wake Forest and the surrounding areas.